Ten individuals suffering from this terrible disease and even though all ten were healed – only one came back to give thanks. Only the one, who was a double outcast, leper and a Samaritan, came back with a heart of Thanksgiving. When Jesus had told him to go to the Temple and let the priest confirm the miracle, he did not hesitate. He threw off his cloak that had covered his deformities and ran as fast as his newly whole body could, to confirm the truth of what had just happened to him. He had never given up hope that someday a miracle could happen. That he could be healed and restored. And He had no doubt about what had just happened. A Jewish Rabbi had healed him and a Jewish priest had pronounced him clean. And so with each step he took on his way to the Temple, he could feel his body and his spirit being restored and strengthened. The other nine however were not so quick to believe. They were confused and hesitant. Oh they had called out to Jesus but really they had sought Christ out of their unbelief. Out of the bitterness they felt towards God because of their affliction. They had lost all hope that they could ever be healed and restored and so when it happened, they were confused and doubted. And they made their way to the Temple too, but in the slow and deliberate way a leper moved. Keeping to the shadows, calling out unclean. Because that was the life they had resigned themselves to. Their leprosy had not only eaten away at their flesh, but also their soul and their hope for anything different. They went to the temple with hearts that had been hardened by their unbelief and their bitterness. And when the priest had pronounced to everyone’s amazement that they too had been healed, instead of joy and thanksgiving, they met their new reality with confusion. How could this be? Disease and misery had become all that they knew. So while the first leper had no doubt who was responsible for this miracle and ran back to find Jesus just as fast as he had run to the Temple in the first place – his heart full of gratitude that had to be expressed, the other nine disappeared back into the shadows of the life they had known. Apparently their bitterness and anger and hopelessness had so consumed them, that even though Jesus had shined the light on their bodies, their souls remained in darkness. Why should they be thankful that Jesus had given back the life that had been wrongly taken from them in the first place? They might be healed now, but what about all those years they had suffered. Would they ever be known as anything other than a leper. How could they be thankful for that? They had become so used to their life of misery and disease that they struggled to see how it could be any different. Sometimes we fail to give thanks because the problems of life seem so overwhelming, so consuming, that we are blinded to all that is good in our life. Ten people who had experienced essentially the same difficulties in life, but nine had become so hardened and negative about life, that even when Jesus blessed them and lifted them out of their hard circumstances, they couldn’t find any praise and thanksgiving in their hearts. I suspect that we all know people like the nine. They are everywhere really. Luke implies that 90% of all of those who cry out to Jesus are like that. I hope that’s an exaggeration but I know that they are in our work place, our schools, our governments, our organizations, our family. Even in the church. No matter what Jesus does for them, it’s never enough. Jesus may heal them of their diseased body but what to do about their diseased hearts. It’s hard to be thankful when all we can see are the problems and not the great things that are happening all around us. Consider the state that our world is in today as we approach Thanksgiving this year. There seems to be so much darkness and despair. So much tragedy. So much violence. So much divisiveness. So much suffering. So much hatred. Why should we be thankful when there is so much pain and tragedy and negativity all around us? But the truth is that if we want to do something about it, if we want things to change, it will begin when we are thankful in all things. When we live our life with an attitude of gratitude we become the change. So as we pause this week to give thanks, I wanted to think for a few minutes about what we can learn from this story about being truly thankful. The first thing I would say is that thanksgiving isn’t dependent upon the circumstances of our life but rather on the giver of life. The Apostle Paul talks frequently in his letters about all the trials he faced in his life. It is believed that Paul suffered from Malaria early on, which left some permanent infirmities throughout his life. That may be the thorn in the flesh that he writes about. He also faced great perils in his ministry. Including being shipwrecked more than once. And he was nearly stoned to death on numerous occasions. He was run out of town after town. And spent much time in Roman prisons. Certainly he, of all people, had much that he could have been bitter about. Much that could have led him to question his faith in response to all the difficult circumstances that he faced. But instead he gave thanks, not for trials, but for the one that would always see him through the trials. He wrote to the church at Thesalonica: In everything give thanks; for this is the will of God in Christ Jesus concerning you. When we live life with an attitude of gratitude, instead of being overwhelmed and shaped by the bad things that happen to us in this world, we seek to understand God’s will in the midst of everything that happens to us. You see, I suspect that the reason that the one leper returned to give thanks was not so much that Jesus healed him of his leprosy as much as it was that he stopped to be present with him, to assure him of His love, even in the midst of his suffering – when no one else in the world would. He was thankful for the healer more so than the healing. I recently read an article which talked about the psychology of cancer, in which the author had interviewed dozens of cancer survivors and asked them what was the worst part of their bout with this disease. And many of those who were interviewed indicated that the worst part was not the pain and debilitating effects of the disease, or the side effects of the treatment that they had undergone, as bad as those things had been. The hardest part had been the sense of isolation and separation that sometimes comes with a diagnosis of cancer. Many of them had experienced the pain of good friends, even family members, falling away from them in their greatest need, creating a feeling in the patient that they were somehow being blamed for their illness. That they were being punished. Most indicated that the worst part of cancer had been the sense of isolation and loneliness and even shame. That’s how it was with leprosy. Many, in Jesus day, viewed Illness as a punishment from God. You see, I think the reason that the one came back to thank Jesus, was not so much that he had healed him, but rather that He was willing to just stop in his journey and engage with him, be present with Him, to reach beyond that isolation and loneliness and shame – and to offer hope, to love him, when no one else would. Thank you Jesus for loving me, being present with me in even the most difficult circumstances of my life. When we live with an attitude of gratitude we do not live in denial of the hard times that come to us all in this world, but rather we look for God’s good will for us in everything, the good and the bad. Living in gratitude redeems even the worst of that which comes to us in this world. A man tells of learning this lesson through the attitude of gratitude of an African-American woman that he came to know. She had so little but every time she sat down to eat, she would bow her head and say, “Much obliged, Lord.” And the man asked her why she did this, because there was so little. She replied, “Sure there might not be much, but it makes everything taste better to be grateful. Looking for good things is a kind of game an old preacher taught me to play. Take this morning. I woke up and thought, What’s there to praise God for Today? And you know what? I couldn’t think of a thing! Then from the kitchen came the most delicious smell that ever tickled my nose. Coffee! Much obliged, Lord, for the coffee,’ I said, “and much obliged, too, for the smell of it. And the hands that have prepared it'” She lived her life with an attitude of gratitude, always looking for the good, rather than dwelling on the bad. Many years later, the man was called to the bedside of that woman as she lay dying. Seeing her in so much pain, he couldn’t help but wonder if she still could find something to be grateful for. Just then she opened her eyes. As she saw him and the others gathered around, she folded her hands and said with a smile, “Much obliged, Lord, for such fine friends.” There was a woman who lived with an attitude of gratitude. She never had much in the way of material possessions. She lived what many would describe as a hard life. But she had lived her whole life looking for the good in every situation even now to the point of death, giving thanks no matter what came her way. Because her gratitude was not based on what she received. No, she was thankful for the one who gave in the first place. Much obliged Lord. And then I think sometimes we fail to give thanks because we believe we haven’t received anything that we didn’t deserve. Perhaps the reason the nine did not come back and offer thanks is because they blamed God for their misery in the first place, and so they thought it was only right that Jesus would heal them. Look how they attract Jesus’s attention in the first place. They don’t cry out for healing, But rather they are looking for mercy in the midst of their suffering. Mercy is a legal term more than it a spiritual one. Their understanding of Jesus was more as judge rather than a savior. Judges give people what they deserve based on the circumstances of their lives. Jesus have mercy on us – give us what we deserve. But those who live with an attitude of gratitude understand that most often what Jesus gives us is not what we deserve. It’s unmerited. Instead we are healed, we live, and we overcome the bad things of this world, through the Grace of God. The one leper came back to thank Jesus not for the healing, but for His grace which brought the healing in the first place. Thank you Jesus for your grace which is always sufficient to get us through. 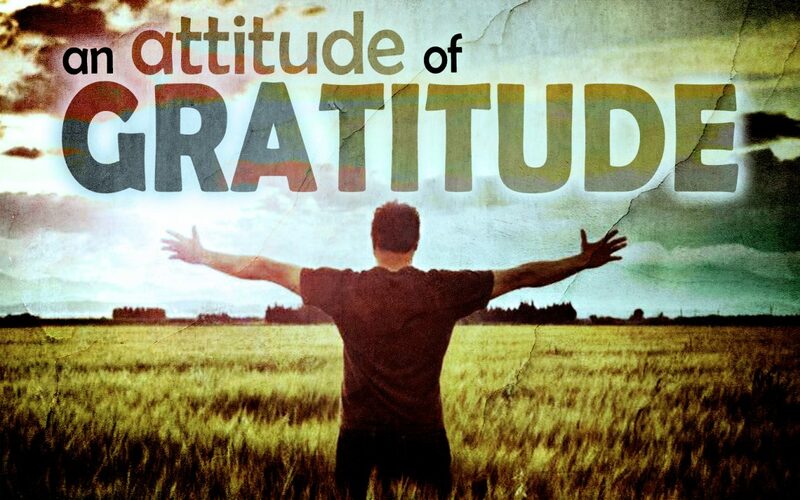 And the final thing I would say is that when we have an attitude of gratitude, our whole life witnesses to it. Jesus not only healed the lepers but he offered them new life. But only one took him up on it. I suspect that the lepers thankfulness was not just a one time expression but rather became a life lived in gratitude. Thankfulness becomes who we are. Because living our life with gratitude doesn’t just get us through the present circumstances but it changes our lives forever. How different our world would be if we all were like the one who came back, rather than the nine who never did. When we offer thanksgiving it changes everything. At age 15, Perry Tanksley became a Sunday school dropout. “No one will miss me,” he assured himself. So he was surprised a week or two later when Mr. Tisdale came to his home. Tanksley tries even now to think why Mr. Tisdale’s visit made such an impression on him. Maybe, he wrote, it was the concern revealed on Mr. Tisdale’s face. Or maybe it was the fact that Mr. Tisdale had walked a mile to tell him he was missed. Whatever it was, it worked. Perry Tanksley returned to Sunday school and later became a pastor. Are there people in your life who need that kind of encouragement today? Living your life with an attitude of gratitude changes lives. And sometimes the life that’s changed is yours.